If you’re looking for pure relaxation, intimate accommodations, and friendly service a little off the beaten track, Bequia is the perfect choice for your honeymoon. With white sand beaches, coral reefs and friendly locals, a Bequia honeymoon offers true Caribbean hospitality. The tiny island only covers 7 square miles, but it’s filled with beautiful secluded beaches and small villages for couples to explore. Honeymooners can spend their days checking out the different beaches and coves, like the private Industry Bay or the livelier Lower Bay, or visiting the town’s capital, Port Elizabeth. Bequia is also a turtle haven and home to many colorful reefs that are perfect for diving and snorkeling. Accommodation in Bequia is generally in boutique hotels and B&Bs where the focus is on friendly service and making your stay memorable for all of the right reasons. So, if you’re hoping to find an exclusive Caribbean island to visit during your romantic getaway, a Bequia honeymoon is a wonderful choice. 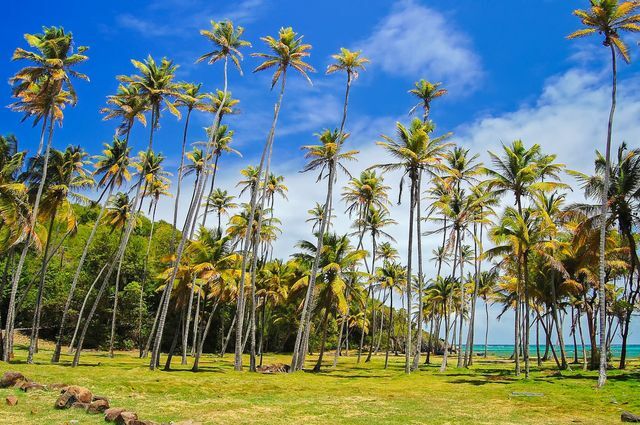 Here’s everything you need to know so you can plan the ultimate Bequia honeymoon. Couples can take their Bequia honeymoon pretty much anytime of the year, since temperatures usually stay in the mid 80s. The dry season from December to early May is the busiest time to visit — since that's when the island has clear skies, low humidity, and excellent sailing breezes. This is also when the island's famous Regatta takes place.The rainy season from June to November offers up some good deals for a Bequia honeymoon, but make sure to bring an umbrella since short afternoon showers are common. Worried about how hurricane season will affect your Bequia honeymoon? Don't fret! Bequia is generally unscathed during any hurricanes as it sits just south of the belt. Explore Belmont: For hip bars and restaurant, take this scenic, coastal path during your Bequia honeymoon. Learn about model boat building: Model boat building is a Bequia specialty and the Sargeant Brothers store is a great spot to learn more about the craft. Laze on Princess Margaret’s Beach: Honeymooners will love spending their days relaxing on this undeveloped stretch of golden sand. Visit the Turtle Sanctuary: Animal loving couples will love this Bequia honeymoon idea. Take a day trip to nearby islands: Pack a picnic and your snorkel gear and head to the nearby Mustique and the Tobago Cays for a fun-filled day. Visit the Bequia Maritime Museum: You can easily Learn more about the islands Scottish ancestry and maritime traditions at this popular museum. Hike Mt Pleasant Hike: Mt Pleasant is Bequia’s highest point and provides couples with stunning views of the surrounding islands. Sip cocktails at Frangipani Beach Bar: Voted as one of the top 100 bars in the world for its friendly staff and excellent cocktails, honeymooners should totally check out this beach bar. On Thursdays at the buffet, there is a traditional steel drum band, too! Tour a plantation: Learn more about Bequia's past by taking a tour of Firefly Plantation, which also has superb accommodation for those who want to stay the night.